Welcome to the first FTN conference – Signal/Noise: A FTN conference on Pedagogy, Technology, and Transdisciplinarity. The title Signal/Noise draws our attention to the ways in which we communicate and collaborate with each other as artists, activists, and academics in a variety of contexts using a multitude of technologies. Whether this communication comes in the form of a series of beats, data vibrations, through parallel wiring or text messaging – the goal of the conference is to create a dynamic space where we might engage, reflect, and learn from this work, each other, and to further transmit and amplify it by imagining anew or (re)working our existing networks. 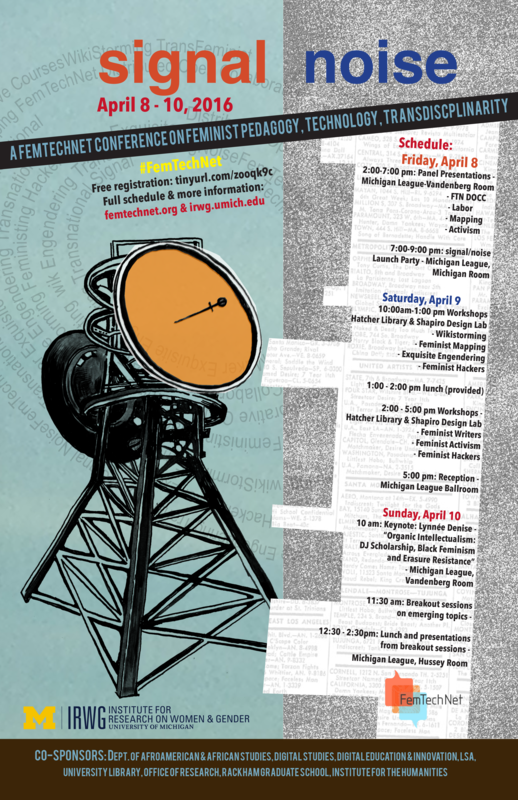 FemTechNet’s conference on Feminist Pedagogy, Technology, and Transdisciplinarity begins with four panels on Friday, which introduces the DOCC, explores issues of labor, and pedagogical possibilities through mapping and activism. On Saturday we will be making and working together in workshops on feminist mapping, writing, wikistorming, exquisite engendering, and hACTIVISM. The purpose of the workshops is to experience a range of DOCC pedagogical approaches based in DOCC pedagogical principles, and to engage in collaborations and create situated knowledge. Sunday’s dialogues will be activated by the signal/noise performative radnote dialogue of Lynnee Denise with Marla Jaksch, followed by modulated grooves of small group conversations brought back to the full circle of participation. Thank you to all who contributed to making the conference come to life including sponsors at the Institute for Research on Women and Gender Studies, University of Michigan, the Department of Afroamerican & African Studies, Department of American Culture, Digital Studies, Digital Education & Innovation, Office of Research, Rackham Graduate School, and the Institute for the Humanities, Lisa Nakumura, Heidi Bennett, Stephanie Rosen, Heide Solbrig, Ann Wu, Veronica Parades, and all the presenters and participants. Registration is FREE although it is important to register so that we can plan food for lunches and receptions. For the comprehensive schedule, please visit Schedule. Please visit the Presenters page. The conference will be held in the Michigan League, located in Central Campus just north of the Michigan Diag at 911 N. University Ave., Ann Arbor, MI 48109. Saturday workshops and lunch will be held in the Hatcher Graduate Library and Shapiro Design Lab, on the first floor of the Shapiro Undergraduate Library (about a 6 minute walk from the Michigan League). There will also be online streaming and meeting rooms for various parts of the conference. USTREAM Conference Streaming Most of the conference events, excluding workshops and dialogue sessions, will be streamed through this platform. Blue Jeans Meeting Rooms Please consult the conference schedule and click on the "Join Virtually" link to various Blue Jeans meeting rooms for concurrent workshops and dialogue sessions. Twitter #FemTechNet Please follow the conference on Twitter using the hashtag FemTechNet. VisitAnnArbor.org has a complete list of hotels, B&Bs, and other accommodations in the area. Detroit Metropolitan International Airport (DTW) is only 20 miles from Ann Arbor, about a 45 minute drive (at the most). Major hubs are: Delta, Spirit, and US Air among others. For more information, call 734-AIR–PORT(247–7678). AirRide: This shuttle runs 13 times during the day and stops at the downtown Ann Arbor Blake Transit Center (10 minute walk from campus) and the Kensington Court Hotel. A one way ticket on AirRide is $15, however, if a reservation is made in advance the fare is reduced to $12. Get more info & make reservations at MyAirRide.com. Ann Arbor Metro Shuttle: $40 University of Michigan Rate for transportation between DTW and Ann Arbor. Must call to make reservations: (734) 507-9220. MetroCabs provide convenient, on-demand transportation from the Airport to points throughout the region. Taxis are available 24/7 from each terminal’s Ground Transportation Center, and no advanced reservation is required. Rental Cars at Detroit Metro Airport: Detroit Metropolitan Airport (DTW) is served by most major rental car agencies. All rental car shuttles pick-up and drop-off at each terminal’s Ground Transportation Center. To access your rental car agency, once you have claimed any checked luggage, follow terminal signs to Ground Transportation. Advanced reservations are strongly recommended, however, courtesy phones for contacting each agency are located in each terminal’s baggage claim and Ground Transportation Center. There are no rental car desks inside the terminals. The Ann Arbor Amtrak Station is served daily by Amtrak's Wolverine, which runs three times daily between Chicago and Detroit. Visit Amtrak’s website for more information: www.amtrak.com. The Amtrak Station is located at 325 Depot Street within the city of Ann Arbor, 0.8 mile from central campus. Greyhound: The Greyhound Station is located in downtown Ann Arbor at 115 E. William Street. See the Greyhound site for scheduling and tickets. Megabus: This station is located on the University of Michigan’s campus at the State Street Commuter Parking lot. Tickets can be purchased at the Megabus site. The Michigan League is located in Central Campus just north of the Michigan Diag. View the League on a campus map, or get directions via Google Maps and MapQuest. Driving Directions here. Take State Street Exit 177. Turn right (north). Continue on State Street approximately 2 miles to the main campus area. Turn right onto North University, which is one block past the Michigan Union. The Michigan League is on your left at the corner of North University and Fletcher Street. Take State Street Exit 177. Turn left (north). Continue on State Street approximately 2 miles to the main campus area. Turn right onto North University, which is one block past the Michigan Union. The Michigan League is on your left at the corner of North University and Fletcher Street. Take Washtenaw-Ann Arbor Exit 37B and turn right (west) onto Washtenaw. Where Stadium Blvd and Washtenaw split (approximately 2-3 miles), stay to the right on Washtenaw following the "Hospital" signs. Turn left at Hill Street (you'll see "The Rock"). Continue down Hill Street (campus buildings will be on your right). Turn right on State Street. Go three blocks. Turn right on North University. The Michigan League is on your left at the corner of North University Street and Fletcher Street. Take US-23 South to M-14 West. Take Exit #3, "Downtown Ann Arbor," which will become Main Street. Follow Main Street to Huron Street. Turn left at Huron Street. Continue down Huron to State St. Turn right on State Street. Turn left on North University. The Michigan League is on your left at the corner of North University Street and Fletcher Street. Take I-696 to I-275 South to M-14 West. Follow M-14 West signs closely. Take Exit #3, "Downtown Ann Arbor," which turns into Main Street. Follow Main Street to Huron Street. Turn left onto Huron Street. Continue on Huron until State Street intersects. Turn right on State Street. Turn left on North University Street. The Michigan League is on your left at the corner of North University Street and Fletcher Street. Take I-96 to M-14 West. Follow M-14 West signs closely. Take Exit #3, "Downtown Ann Arbor," which turns into Main Street. Follow Main Street to Huron Street. Turn left on Huron Street until State Street intersects. Turn right on State Street. Turn left on North University Street. The Michigan League is on your left at the corner of North University Street and Fletcher Street. Take I-96 to US-23 South. Drive on US-23 South to M-14 West (Downtown Ann Arbor) Exit. Take Exit and drive about a mile to Exit 3, also marked "Downtown." Take exit ramp, which turns into Main Street. Follow Main Street to Huron Street. Turn left on Huron Street until State Street intersects. Turn right on State Street. Turn left on North University. The Michigan League is on your left at the corner of North University and Fletcher Street. Parking for Michigan League, Hatcher & Shapiro Libraries Parking is extremely limited near the U-M campus. There is no free parking on Friday or Saturday near campus. Free parking in commuter lots approximately 2 miles from campus. Please check the AATA trip planner or Google Maps to find out the bus schedule that fits your needs. Ann Arbor Transportation Authority (AATA) regular bus fare is $1.50 per trip. You can pay with cash, bus pass or tokens. Passes & tokens are available at the downtown AATA Blake Transit Center and online. Check bus routes and schedules. U-M Buses are big and blue. They go all over campus. Operating hours are from 5:00 AM to about 2:30 AM weekdays (7:00 AM to about 3:00 AM weekends). Visit the Parking and Transportation Services website for information on all campus buses. Maps of metered and structure parking on the Ann Arbor DDA's website. The Forest Avenue Parking Structure is the closest to the libraries. Liberty Square or Maynard structures are the closest public structures, within a few blocks of central campus. The rate is $1.20 per hour. Parking is FREE in Ann Arbor (street parking and structures)!! The U-M Parking and Transportation Services site provides a comprehensive source for parking options, as well as bus routes and other transportation information. PDF Map of Central Campus from the U-M campus parking office which shows the nearby structures. Visitor Parking is in RED. Operated by the Ann Arbor Transportation Authority, ‘The Ride’ is a top-notch public transit system, offering over 1500 stops in Washtenaw County. Fare is $1.50 per person. Exact change is needed. Passes are available at the downtown AATA Blake Transit Center and online. Check bus routes and schedules.Visit TheRide.org for more information. There are over 20 taxi cab service providers in Ann Arbor. You will need to CALL for pickup within 5-15 minutes. See the full list. If you need to rent a car during your visit to the Ann Arbor area, there are several companies that can assist you. Many have multiple locations so you can get exactly what you need, where you need it. For a full list of rental car agencies in the area, click here. Zipcar is a national car-sharing service that allows you to reserve and rent cars by the hour or day without the hassle of a traditional car rental. Cars are located all around Ann Arbor. Zipcar members can reserve cars online then swipe their card at the vehicle to unlock doors. Gas and insurance are included. See Zipcar map for locations. It exists in Ann Arbor. You know what this is. Arbor Bike - Bike share system intended for short trips around town. Members have access to an unlimited number for 60 minute trips while their membership is active. As long as each trip is kept under 60 minutes, no additional fees, outside of the initial membership fee, are incurred. Anyone over the age of 18 with a valid credit card or debit card can become an ArborBike member. U-M Buses are big and blue. They go all over campus. The University's 12 bus routes carry approximately 7.2 million passengers per year. The bus system is free to the general public, and generally operates from about 5:00 AM to about 2:30 AM weekdays (7:00 AM to about 3:00 AM weekends), with reduced hours during spring/summer terms and on holidays. The University of Michigan Work-Life Resource Center provides information and options for childcare services in Ann Arbor. Can’t find what you need? Contact Amy Szczepanski, Community Child Care Resources/ Campus Child Care Homes Network Manager, University of Michigan Work-Life Resource Center; (734) 763-9379. MWireless is the most secure WiFi network and should be used by all U-M faculty, staff, students. Login required. MGuest is free wireless network provided for University of Michigan visitors. It is open and insecure, no encryption is provided by the network. It is available in most campus buildings, including conference venues. eduroam is a secured WiFi network service that allows students, staff, and faculty to use their home institution's WiFi credentials without having to set up a guest account. Check if your home institution participates: https://www.eduroam.us/institutions_list. This conference is sponsored by the Institute for Research on Women and Gender Studies, University of Michigan, with support from the Department of Afroamerican & African Studies, Department of American Culture, Digital Studies, Digital Education & Innovation, Office of Research, Rackham Graduate School, and the Institute for the Humanities.